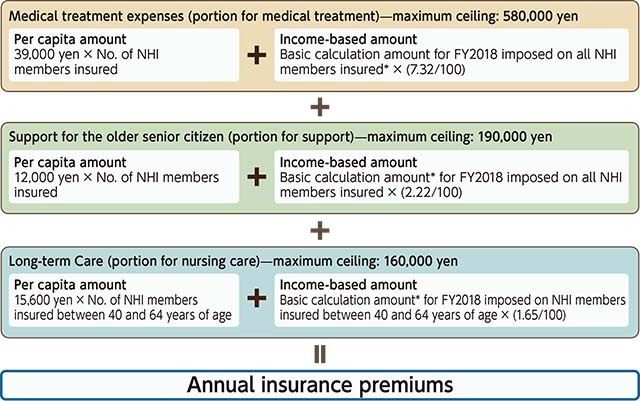 * “Basic calculation amount” refers to the amount remaining after subtracting 330,000 yen from the amount of total income earned the previous year. Note: If you moved into Shinjuku City on or after January 2, 2018, the notification mailed in June will only have the per capita amount. Afterward, your basic calculation amount will be calculated based on your resident tax taxation information from your previous address, and you will receive notification of your adjusted insurance premiums with the confirmed income-based amount added. ● Please be sure to file notification even if you are late for some reason. Eligibility for National Health Insurance begins from the day when a person must enroll. Even if you are late in completing enrollment procedures, insurance premiums will be charged dating back to the date of eligibility. Those who work in an organization, such as a company, should enroll in the health insurance of their place of employment. Please consult your place of employment concerning enrollment procedures. Please bring your National Health Insurance card and the new health insurance card of your place of employment to the appropriate service counter. 1. When you file a notification, please bring any document that can confirm your individual number (“My Number”; i.e., your notification card) and any item that can verify your identity (residence card, driver’s license, passport, etc.). 2. If a proxy is filing a notification for you, please have him/her bring a statement of power of attorney from you, along with documents that confirm his/her identity in addition to the above. 3. Withdrawal procedures from National Health Insurance can be completed by mail. For application procedures, please read the instructions on the Shinjuku City website, or call for more information. The basic calculation amount of insurance premiums is calculated based on the resident tax. Please file a resident tax report with the municipal office where you were registered as a resident as of January 1, 2018. Note: If you have filed an income tax report, there is no need to file a resident tax report.